These are photos of the first three steps of a painting I am currently working on (July, 2011). Working title is “Apso Repose”. 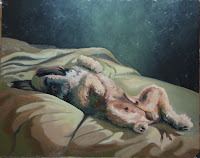 My idea comes from a desire to convey the ability of dogs to totally relax, let it all go, enjoy the moment, and luxuriate in something forbidden…master’s bed. My broader concept is to convey the dignity and worth of dogs as created beings deserving of respect and love. When attempting a painting, especially one of animals in which I am dependent on photos, for the most part, my first step is usually to take hundreds of photos. I glean those down to several potential ideas, and crop, cut and paste, size, and Photoshop them into a more workable format. It is rare to take a photo that ends up being exactly what I’m looking for all in itself, but it does happen. Next, I grid the photo and a piece of drawing paper the exact size as the painting I intend to do. I draw the idea to near completion using either graphite or charcoal. (First picture, done in charcoal.) After preparing a support, either canvas or board, I transfer the basics of the drawing onto the support. Detail is unimportant, but placement is, especially as regards facial features. Just a general outline is all I need. Next, I execute an under painting (second picture) in the same values as the drawing. Sometimes I use only one or two pigments, other times I use several colors, but always concentrate only on basic values. This is a 16 x 20 board which was prepared with several coats of gesso and stained with yellow ochre. The underpainting was done with yellow ochre, burnt sienna and ultramarine blue, and white. These constitute three primaries, and give a range of values from very light to very dark, close to black. The under painting is done very thinly, with much of the stain still showing through. When it is dry, the actual painting begins. After the under painting dries, I begin the work of actually executing the painting, usually in several statements over a period of a week or two. The third picture shows the 1st statement of this painting. I added the colors quinacridone red, cadmium yellow and transparent red ochre to the original colors I chose for the under painting for my palette. The colors are mostly "flat", without much modeling, and more saturated, or bright than they will end up being in the final painting. I'll let this dry and then continue on with another layer of paint, concentrating on the bedding and more detail on the dog. I've put in the dark background, and it may, or may not, get another coat of paint. Hopefully, the next picture I post will be of the finished painting!